Terminal block for hardwiring connections. See related products' connectors to make this dimmer "plug&play" with various CYRON product series. 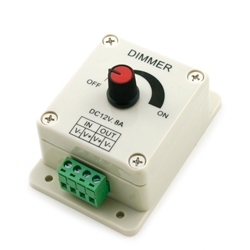 NOTE: Unlike traditional wall dimmers, this dimmer is wired between the 12VDC power supply and the lights.